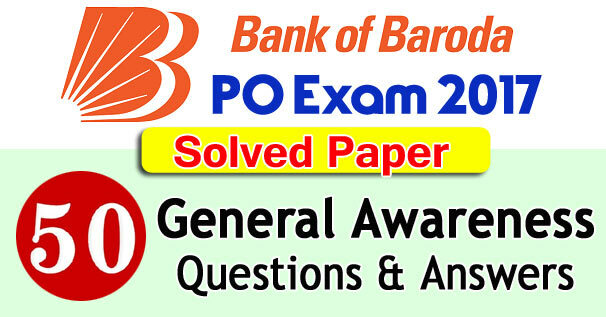 Here, we are presenting solved paper of General Awareness for Bank of Baroda Probationary Officers exams. This exam was held on 27th May, 2017 on different examination centers. You can understand the pattern of bank exams with the study of these questions and then you can get sure success in the next bank exams. 10. Which of the following is not a part of Digital banking campaign ? 15. World Blood Donor Day is celebrated every year by the people in many countries around the world on which date? 17. The headquarters of World Intellectual Property Organisation is in which of the following country ? 27. The India's longest cable-stayed bridge was inaugurated by PM Modi in which of the following states? 29. Which of the following statements regarding Non-banking Finance Companies (NBFCs) is 'not' true? (A) The NBFCs are allowed to accept/renew public deposits for a minimum period of 12 months and a maximum period of 60 months. (B) The NBFCs cannot offer gifts or any other additional benefit the depositors. (C) The NBFCs can accept demand deposits repayable through cheques. (D) The deposits with NBFCs are not insured. 30. Which of the following teams has recently won the UEFA Champions League? 33. Who is the incumbent governor of RBI ? 34. Which of the following Indian athletes had won silver medal in Rio Olympics, 2016 ? 35. UPI enables bank account holders (of banks participating in UPI) to send and receive money using a VP A without entering additional bank information. What is the full form of VPA ? 36. Which of the following is the India's first state to get World's largest roof top solar power plant? 37. Who is the President of 'Republic of Turkey' ? 38. What is the current repo rate? 39. Which of the following is honoured with Vyas Samman Award 2017 by the PM Narendra Modi? 41. The Reserve Bank of India has constituted which committee to study various facets of house-hold Finance in India? 42. Who had won the 2016 Wimbledon Open in Women Singles? 43. Which of the following is the dimension of the new Rs. 2000 note? 44. The Federation of Indian Chambers of Commerce and Industry (FICCI) is headquartered in which of the following states ? 45. Whenever a transaction is completed and the cardholder (or his or her credit card) is not physically present to hand to the seller, it is known as CNP. What is the full form of CNP ? (A) India and Nepal (B) Nepal and Bhutan (C) India, Japan and U. S. A. 48. 'Jitu Rai' a gold medallist in ISSF, is associated with which of the following sports? 49. We can recharge, pay bills, send money, shop, get offers and more using Pockets App. Which of the following banks launched this application? 50. After the merger of SBI with its associate banks, the assets of SBI had increased to which of the following?